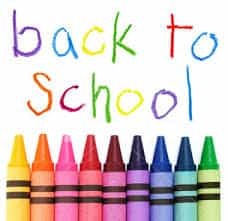 It is hard to believe that August just turned into September and that it is the time of year for “Back to School”! 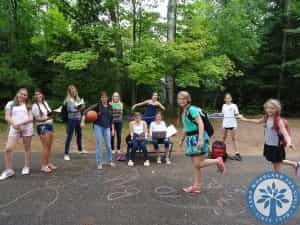 At the start of each summer, campers have the opportunity to set goals for themselves. Campers may strive to pass a certain level or rank in riflery or archery, or to do a back walkover or other skill in gymnastics. Some campers may challenge themselves to learn how to canter in riding, make a mooring in sailing, or perfect a dive at the waterfront. Learning independence while away from home for the first time and making new friends are goals that campers often make each summer. For others, it may be the challenge to try something new. Begin each day on a positive note – remember to eat breakfast and put on a smile every morning! Do your very best – no matter what classes you may be taking this year, try your hardest to pay attention in class, ask your teacher when you need help, and do your homework! Make a new friend – how awesome would it be to be the one to reach out to a student who may be new to your school or who may not have a friend to sit with at lunch?! Be a good steward of your school and community – just like we each did our part every morning after breakfast during cabin clean-up, take the time to pick up a piece of trash lying on the ground, recycle a plastic bottle, or tidy up your own space when finished eating (and clean your room!). Try a new extracurricular activity – maybe this is the year that you will sign up for the club, music lesson, or sport that you have always wanted to do, but up until now have lacked the confidence to take that first step. Be a team player – this means to exhibit good sportsmanship wherever you go…on and off the field! Look behind and look ahead – remember to be a good role model for those younger than you and be open to learning from those who have more experience than you. Take a rest hour EVERY DAY! : School days are BUSY, and you need some “down” time to read a book for pleasure or even take a nap. Try spending some “unplugged” time away from your phone, computer, video games, or other technological devices. Communicate with your parents – they are your “counselors” now and would LOVE to hear the details about your day! Enjoy family time – just hanging out, eating meals together, playing a game, or going on some fun adventure!